"The whole of the 20th century has always put the car at the centre. So by putting the pedestrian first, you create these liveable places I think, with more attraction and interest and character ... liveability." 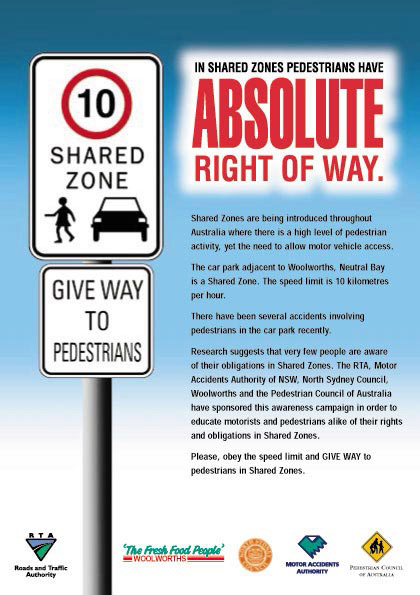 Pedestrians' rights are being promoted in the new SHARED ZONE campaign to be launched on Tuesday 4 July 2000 in the Woolworths Car park - Neutral Bay. In a unique cooperative promotion, the Pedestrian Council of Australia (PCA), the Motor Accidents Authority of NSW, the RTA, North Sydney Council, and Woolworths have developed a SHARED ZONE campaign to increase pedestrian safety and awareness in targeted areas where pedestrians are at risk. Motorists must adhere to a strict 10km/h speed limit, with an understanding that a SHARED ZONE is like a full-time pedestrian crossing. While motorists can travel very slowly through and park in these zones, they must GIVE WAY to pedestrians in all circumstances. Under the new Australian Road Rules, which came into force on 1 December 2000, pedestrians have ABSOULUTE RIGHT OF WAY in SHARED ZONES. Similar zones are used widely and most successfully in North America and Europe. "The SHARED ZONE is an important Regulation which not only vastly improves pedestrian safety, but greatly enhances pedestrian amenity. This in turn will only improve the shopping environment and trade and commerce in general. The Education and Awareness of motorists and pedestrians alike, as well as state and local government support, is vital for the success of this initiative," said Harold Scruby - Chairman/CEO - PCA. Create awareness about Shared Zones for both the community generally and Local Councils, with the long-term objective being to encourage their wider understanding and use. Inform pedestrians and motorists of their rights and obligations within Shared Zones. Generally improve the shopping and commercial environment. Improve the safety, amenity, access and health of pedestrians throughout NSW. The RTA will be upgrading the signage in Shared Zones to include the sign "Give Way to Pedestrians". These signs are now in place in the Woolworths car park at Neutral Bay, as per the attached flyer. Woolworths (Neutral Bay) will be handing out 50,000 Shared Zone flyers to their customers over the next week to assist in motorist and pedestrian awareness and education. "We are firmly committed to SHARED ZONES and look forward to creating them throughout our municipality where appropriate". said Clr Genia McCaffery - Mayor of North Sydney Council. Ms Reba Meagher MP - NSW Parliamentary Secretary for Roads added; "Our government is keen to see councils promote the use of Shared Zones throughout NSW as they are a wonderful way of vastly improving pedestrian safety and amenity while still permitting vehicular access."